May 15, 2015 May 15, 2015 | Jess G.
I planted parsley seeds in my garden this morning. My Italian friends always use parsley in Italian cooking, but this is an herb that I often overlook. It’s readily available in the grocery store year-round but is also super easy to grow in your garden or in a pot on your windowsill. It is a biennial plant which means you plant it once and it will return to the garden year after year. This plant is a super low calorie food with some of the most nutrient dense leafs but contains zero cholesterol or fat! 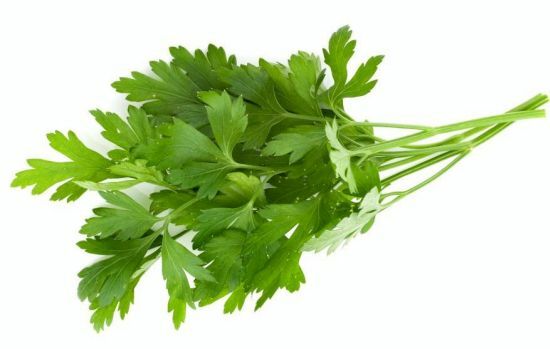 Just 10 sprigs of fresh parsley can provide 205% of vitamin K needs for the day, as well as 22% of vitamin C and 17% of vitamin A with only 4 calories. Great for healthy skin because of its high levels of Vitamin C – essential for collagen production, wound healing or clearing up blemishes and Vitamin K which may also help improve skin’s elasticity and tone. < 11 Miles running in SNOW SHOES!